Home»Summary Report: ASTI Subregional Technical Review Workshops. 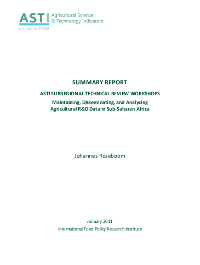 Summary Report: ASTI Subregional Technical Review Workshops. The objective of ASTI’s recent subregional technical review workshops was to elicit feedback from national collaborators in Sub-Saharan Africa on their experiences in implementing ASTI’s national survey rounds and to explore ideas and suggestions as to how ASTI’s activities in the region can be improved and strengthened. The discussion during the workshops focused on all aspects of the process—specifically, collecting, synthesizing, analyzing, disseminating, and using ASTI data. Overall, the national collaborators considered ASTI’s survey approach to be sound and well structured. Nevertheless, various suggestions were made as to how ASTI’s methodology could be improved. Moreover, additional indicators were suggested for inclusion in the survey. A more fundamental discussion focused on whether ASTI should continue to perform ad hoc surveys over time (currently involving time lapses of six to eight years) or attempt to institute a more permanent arrangement under which national agencies assume responsibility for implementing the survey, synthesizing and analyzing the data, and disseminating and ensuring the use of the outputs at the national level. Participants strongly supported the idea of a phased transition, and suggestions were made on how this transition should be implemented. A more proactive dissemination and use strategy has already been implemented with the current survey, including media events, national workshops, a redesign of ASTI’s website, and promoting the use of ASTI’s results in presentations and papers by NARS leaders and opinion makers. It is too early to evaluate the effectiveness of this updated strategy (the survey results are only just being released), but some of the participants offered feedback on their experiences with the dissemination and use of ASTI’s 2001–03 survey results at the national level. During the workshop consensus emerged in support of closer collaboration between ASTI and Africa’s numerous national and subregional organizations to promote participation in, commitment to, and the relevance of the ASTI survey (i.e. generating primary data on a an important policy issue) and to incorporate policy analysis and monitoring and evaluation activities related to key regional agricultural policy initiatives: the Comprehensive Africa Agriculture Development Programme (CAADP) and the Framework for African Agricultural Productivity (FAAP).